Found 3 file extension associations related to Go!Zilla and 3 file formats developed specifically for use with Go!Zilla. Recover from download errors and resume failed downloads, manage and categorize files to download later and get those files from the most responsive site with Go!Zilla. Gather links to files that you want to download by simply dragging themfrom your favorite internet browser or Go!Zilla can integrate with your browser for easy click and download support. You manage and categorize your files using an intuitive Explorer-style interface. Instantly see file sizes, estimated download times and network connection performance. You can even add as many different locations for a single file as you can find or let Go!Zilla do the work by quickly searching FTP archives. Then when Go!Zilla retrieves the file for you, it checks all available locations and delivers the fastest possible connection. 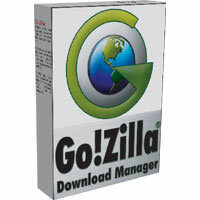 Go!Zilla will even resume a failed download from both FTP and HTTP web sites. Downloads can be started at any time, or scheduled for later whennetwork traffic dies down. And now with SmartUpdate you will be automatically notified of updates and information about your favorite programs. If you need more information please contact the developers of Go!Zilla (Headlight Software, Inc.), or check out their product website.